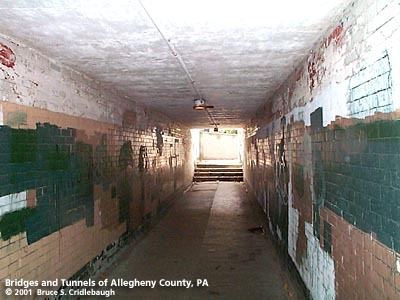 The pedestrian subways of the Pennsylvania Railroad mainline are examples of sites which were once celebrated for their importance, but are now obscure and abandoned. The settlement of Wilkinsburg and surrounding neighborhoods began not long after the establishment of Pittsburgh brought some security to the region. In 1769, most the land was acquired by patent within days of its offering by the Land Company of the colony of Pennsylvania. In 1789, a tract on the Great Road [Penn Av] was conveyed to Dunning McNair. He laid out a plan of streets bounded logically by North, East, South and West streets. First known as Rippeysville, after a sister of McNair, then called McNair's Town, the town grew slowly with the ever increasing traffic on the turnpike, Penn Av, which carried the combined traffic of the Northern and Southern Turnpikes between Philadelphia and Pittsburgh. Around 1812 the name of Wilkinsburg became prevalent being derived from the prominent family in the area -- specifically in honor of Judge William Wilkins who was very active in political service on all levels. In the 1820s, James Kelly acquired large tracts of land throughout the area; his holdings stretched from Lang Av in Point Breeze westward to Wilkinsburg Hill, present-day Ardmore Blvd, and southward from tiny Wilkinsburg in a section called Isherwood, now Edgewood. Over time he sold off parts to others who laid out residential plans. The trend exploded with the construction of the Pennsylvania Railroad in 1850-52 which cut diagonally across many of the established streets. At that time only one or two trains each day would pass along the single track of the new railroad and the line was built at the same level of the streets. The Pennsy and the railroad suburbs grew together. The railroad eventually had at least four tracks and right-of-way for more. Real estate records for the area show the massive burst of homebuilding. After James Kelly had begun the subdivisions of Homewood and Brushton, his fortunes turned in the Panic of 1873. The names of Mellon (partly from his foreclosure of Kelly), Magee and others who would rise to prominence first in Pittsburgh's real estate then in business, finance and politics, were seen to taking over the former Kelly properties. Along Penn Avenue about three dozen of the rich and famous built their great mansions: Frick, Westinghouse, Andrew and Thomas Carnegie, Heinz and many others. But as the town prospered from the steaming presence of the railroad, it also learned the danger of the many grade crossings. Though it was in the interest of both the railroads and the towns along its path to separate the tracks from the streets, there was slow progress due to the cost and complication -- and the litigation for who should bear what part of the process. Wilkinsburg passed its first ordinance to abolish the grade crossings October 9, 1911. An agreement between Wilkinsburg, Pittsburgh and the PRR was signed December 2, 1911, followed by a Wilkinsburg ordinance to close several streets a year later. The agreements were never fully accepted by the railroad and the process languished. Public agitation grew as the accidents continued. A new ordinance was passed March 9, 1914, accepted by the railroad, and construction began. At a cost of $3 million, the railroad was raised up to 12 feet between Homewood and Edgewood. The 1905 Edgewood Station by architect Frank Furness was retained. Walter Cookson designed the third Wilkinsburg station in 1916. Much larger and more modern than the others, this station which is being rehabilitated in 2000, was a testament to the standing of Wilkinsburg as the prototypical railroad suburb. Each day residents would commute by train into Pittsburgh; in recent years the Port Authority has tried to rekindle the concept by constructing a busway along the railroad right-of-way. The significance of the grade separation project is reflected is the following passage quoted from Gilchrist's 1940 "History of Wilkinsburg:"
Great preparations had been made for the proper celebration of the grade crossing elimination. June 8, 9, and 10, 1916 was chosen for this purpose. The Pennsylvania Railroad Company had completed its great task of eliminating the grade crossings at Wilkinsburg, Brushton, Homewood, and Edgewood at a cost of $3,000,000.00 and the building of two new stations at a cost of $200,000.00. The company began at Homewood at zero and raised the track until it reached a heighth of twelve feet ending at Edgewood. Work began November 27, 1912 and its completion was celebrated on the above dates. The railroad magazine "Information" issue of July 18, 1916 calls this celebration the most remarkable three day celebration ever recorded in American Civic History. The parade was four miles long, was witnessed by 75,000 people, and both local papers, -- the Call and the Sentinel -- issued special editions describing and picturing our town from every angle. The Pittsburgh and Pitcairn shops were closed, and their divisions of the parade showed almost every department and calling in the business of railroading from the trackman, locomotive, and equipment departments to the telegraph departments. All had floats showing just how it was done. Thirty-six departments in all were represented. All borough officials and departments were likewise represented, as were all the merchants. Games and sports of every kind were provided, and the great parade on June 10 was the climax. The three outstanding men directing this crossing elimination work were, for the borough Councilman Samuel A. Taylor, for the railroad company A. E. Shand chief engineer, and F. M. Sawyer, construction engineer. Perhaps no where in the country has a piece of work of such magnitude been brought to completion with such good will on the part of all concerned as was this. This was evidenced by the banquet tendered the railroad officials by the citizens on the last night of the celebration." Prior to the project there were apparently only two locations which offered a grade separated passage across the tracks. Both were built over natural hollows created by small streams which are now gone. At Kelly Av, a stone arch was constructed to carry the original Pennsylvania Railroad over the street. A smaller, but similar stone arch was constructed over Race St in Edgewood. While the other crossings along the raised section of the railroad required wholly new structures, the bridges at Kelly and Race were given vertical concrete extensions to raise the level of the trackbed. Gilchrist, Harry C. "History of Wilkinsburg Pennsylvania:, 1940; Davison & McKee, "Annals of Old Wilkinsburg and vicinity: the village, 1799-1888," 1940.